a pet, or even two. When hunting for his new best friend, a boy goes through an alphabetical menagerie of animals. From an antelope, to bobolink birds, to wolves and zebras—and of course, a cat and dog, too—he brings them all home. But each creature just makes his sister go AH-CHOO! Will he ever be able to have the perfect pet? 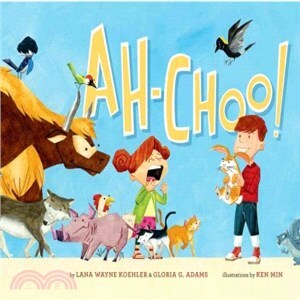 Lana Koehler, from Stow, OH, is a retired music teacher who writes a music column for the Ohio Home Educators Association.Ah-Choo! is her first book. Gloria Adams, from Stow, OH, is a former children's librarian and storyteller. When she was growing up she wanted to be an archaeologist, an ice skater, a writer, or a princess. Now, she spends most of her time writing books for children.Ah-Choo! is her first book. You can find out more about her on her website: gloriaadams.com. Ken grew up on the works of Margret & H.A. Rey, William Joyce, and DC Comics. He was born and raised in Los Angeles and studied illustration at Art Center, College of Design. He has storyboarded for various commercials and animated TV shows such as The PJs, Futuramaand Fairly Odd Parents. His illustration work has been recognized numerous times by the Society of Children’s Book Writers & Illustrators (SCBWI). In 2012, the first picture book he illustrated, Hot, Hot Roti For Dada-Ji (Lee and Low), received the Picture Book Honor Award for Literature from the Asian Pacific American Librarians Association (APALA). These days, you will find Ken illustrating, storyboarding, writing, and dreaming up stories for children.